Any lover of books has probably dreamed at some point of having a home library. Very common in the 19th century, home libraries are now a rarity in this day and age of digital books and eReaders. Still, have a home for your books – and a whole room devoted to reading – can be an enticing idea, and creating a home library is easier than you think. The first step to creating a home library is to find a space. If you have a whole room to dedicate to books – lucky you! 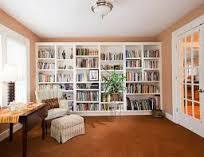 If space is a little more scarce in your home, you can add a library to an existing room. Of course, adding books in your home office is a great idea, but you can also section of a corner of a large formal living room or dining room and create a “book nook.” If you’re really feeling creative, you can even transform attic space or a section of a finished garage into your reading area. Next, you’ll need shelves. If you’re dedicating a room to your library, you can choose traditional floor to ceiling bookshelves in your favorite wood finish and line the room. If you’re adding books to your office, wall mounted shelves will create space in an already filled room. In a living area, think about using open two-way bookcase units that are designed to be viewed from either side, or use tall bookcases to create separation in the room. Ironically, the most challenging aspect of creating your home library might be finding the books! If you’re like many, you’ve transferred your reading habit from paper to plastic – in the form of a Kindle or iPad. Hopefully, you’ve held on to a few boxes of beloved books – from literature classic to your ear-worn set of Lou Mason paperbacks. If your supply is lacking, head for a used bookstore to find classic mysteries and current bestselling thrillers for bargain prices. Of course, to create a home library, all you really need is space, books and shelving, but you can add a little flair by decorating the area. An opulent throw rug will give your library a more traditional appearance, and a comfortable chair and reading light will make the space functional. Decorate the walls or the area with framed covers of your favorite titles or prints featuring classics like Sherlock Holmes or The Maltese Falcon, and feel free to add a few trinkets to personalize the space. While it may seem like a luxury, a dedicated home library or reading area can help you enjoy your favorite hobby even more. Surround yourself with books in a comfortable reading space – and you may find yourself dusting off those classics you forgot how much you love.